For the last seven months I’ve had the opportunity to start my own fledgling marketing communications consultancy and this blog. The experience has been both personally and professionally rewarding, and has transformed the way I approach my career and the rapidly changing field of marketing communications. I thought it was about time that I created some take-aways from this experience that other practitioners could both benefit from and add to. 1. Hustle. Whether you own a successful business or have a pretty steady gig, you can’t afford to get complacent about your career. A good approach is to think about your career like an entrepreneur would approach a business, and never take anything for granted. 2. Make a Plan. Creating a mission, vision and values statement can help you focus on your unique strengths and distinguish you in the marketplace. Conduct a SWOT and draft a plan that will help align your skills to the demands of the marketplace. Create goals and objectives for your career and a road map for how you’re going to reach them. You can alter your path as necessary, but your mission, vision and values should steer your course. 3. Grow your network. LinkedIn, Twitter, Blogs and other social media sites offer powerful opportunities to connect with thought leaders and peers. Professional associations like the International Association of Business Communicators, the American Marketing Association and the Canadian Marketing Association run networking and educational events. The choices are limited only by your time and means. 4. Take risks. What opportunities are available? What are you willing to risk in order to succeed? While you should understand your own risk tolerance before you undertake any new ventures, you should also aim to push yourself out of your comfort zone, as this is where the real professional and personal growth occurs. 5. Invest in yourself. In this economy you need to continually assess what investments you need to make in yourself in order to succeed. What is the time, effort and cost involved? What is realistic in terms of your personal obligations and work/life balance? There are a dizzying array of informal and formal education and networking opportunities out there, so make sure your decisions are strategic and align with your plan. 6. Ask for support. Family, friends, professional networks and mentors can provide a valuable source of objective advice and support. Don’t be afraid to reach-out beyond your network both online and in person. 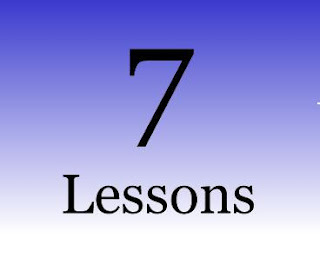 What key lessons have you learned that you can pass on to others? Take a few moments to share your own experiences here and add to the list.